We came to Greenspond to hike this trail and because it is one of the places in Newfoundland which I had never seen. It was a wild and windy day with heavy rain. My husband couldn’t keep the camera lens dry and in fact, shortly after, it shut down completely. I am in the moment, but I am getting very cold and wet. Pluviophile- lover of rain: someone who finds joy and peace of mind during rainy days. During heavy rain, I think I find my joy and peace of mind indoors…….so when I felt the wind forcing the rain inside my hood and down my ear, we both called it quits and returned to our CV. My hands were so cold, I could barely get out of my wet clothes. Dry clothes, hot tea, and some comfort food..grilled cheese sandwiches with fruit, revived us and after a short reading break we did manage to get a few more photos of beautiful Greenspond. Love the yellow house with its vibrant colours and flowers. The lighthouse is still manned. The weather started to clear, but we had no suitable dry footwear so we decided not to try the trail again……but we will definitely come back and hike it. It is just so picturesque and so much work has gone into making it. I wonder if these guys will still be here upon our return? I love the sea in all its moods. Awesome is everywhere. I opened my eyes and felt restless, needed to go exploring. The wind was blowing from the southwest but was high, which made it a little tricky to land the boat on some of my favourite islands. I decided that I wanted to explore a favourite childhood haunt, Grassy Island and my husband headed the boat in that direction. GO BACK FROM WHERE YOU CAME! Should we leave? Should we stay? Grassy Island has changed. What has happened here? We found dead birds and this gaunt, skeletal one who couldn’t fly. 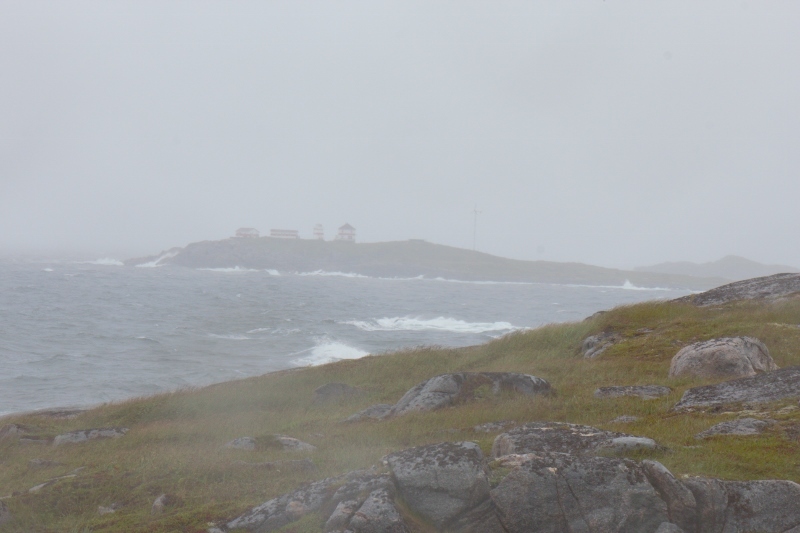 My day of trekking fired my imagination……..but truly the island does have an eerie feeling. We used to have picnics here and pick blackberries but now it has a ghostly ambiance. In the winter, we would sometimes skate out here. That’s a long way for a little girl to skate, even if my pesky older brother was with me. There is still beauty here but something feels wrong. I love the smell of possibility – in the morning. Treks, tales, the telling of tales and walking trails are all a part of our summer 2016. Keeping grandchildren active and entertained can be a daunting task when they have so many devices that bring the world to them via the internet. Thankfully they are physically active as well as technology active. Newfoundland outports offer a whole new world to learn and try new things. Cod jigging is a source of delight. Learning food sourcing is also educational…..but I didn’t tell them that. Surprisingly, they also liked learning how to clean the fish! The Cove in a tranquil mo0d. Right distance, there is definitly balance and fine tuning at play here. When I was a child, a favourite pastime was walking on stilts. My brothers would make them and they were sooo much fun. I wanted my grandchildren and nephews and nieces to experience this and my brother volunteered to cut the sticks and make them. A wide base is not good when walking on stilts. Practice and balance and the fun begins! Beautiful Banting Memorial Park. It was cold when my younger grandchildren came but oh we had so much fun! I had never seen seaweed like this….he said it was like a big lasagna noodle, a perfect description! Much warmer the following week! New adventures await! So much to do at Banting Memorial Park, Musgrave Harbour…the beach is awesome, there are paddle boats to rent, mini golf, volleyball, swimming in the pond and the Banting Interpretation Centre…..a must see. This plane crashed about 10 miles from here in the early 1940’s. Only the pilot lived and Sir Fredrick Banting, co-discoverer of insulin and two others were killed. Such a tragedy. The park is, of course, named after him. Many years later the plane was brought here and the Interpretation Centre tells it’s story. My younger grandson was intrigued and very interested in this, as was my brother’s grandson. On the trail at the Beothuk Interpretation Centre, Boyd’s Cove, NL. My blog post from October 2015 tells much more bout this site. I am so happy that my grandchildren had a chance to learn and explore here. Presenting a gift in the Spirit Garden. I am moved. A scene that I will never forget. These two (my grandson and my sister’s grandson) rarely see each other. Here they observe a few minutes of silence (with no prompting) to offer respect to the spirit of the Beothuk people. Summers are made for exploring. Much to my chagrin there is no theatre company in the Cove but, with a lot of imagination and a bag of dress up clothes, the possibilities are endless! Playing ball, doing cartwheels, shooting baskets, beachcombing, roadside sales, playing cards, doing crafts, painting, scavenger hunts, having a DFD (device free day) and not once asking to use it!!!……. filled the remaining hours. We learned so much and hopefully they learned a little too. ………………I must go and start my list for next year.